The ongo­ing research project at Mas­sas­oit Com­mu­ni­ty Col­lege attempts to help answer a ques­tion that is shared by many ecol­o­gists and oth­er sci­en­tists around the world: “How does human activ­i­ty alter the world we live in?” The answer to this ques­tion has obvi­ous exis­ten­tial val­ue to every human on earth. It is also obvi­ous that there is no com­plete or even par­tial­ly sat­is­fy­ing answer to to be had. How­ev­er, the ques­tion itself pro­vides a start­ing place for an infi­nite num­ber of spe­cif­ic, mean­ing­ful, and much more answer­able ques­tions and sci­en­tif­ic inquiries. Massasoit’s ver­sion of this ques­tion is focused on how local land-use prac­tices impact our local ecosys­tem, par­tic­u­lar­ly the abun­dance and diver­si­ty of local native bee com­mu­ni­ties. Stu­dents are more ful­ly engaged in all aspects of research than the vast major­i­ty of under­grad­u­ate research par­tic­i­pants, even at pres­ti­gious four-year schools. Under­grad­u­ates typ­i­cal­ly have the oppor­tu­ni­ty to work in a research set­ting only as Juniors and Seniors, and often in a lim­it­ed, task-ori­ent­ed man­ner. Mas­sas­oit research stu­dents are trained in more than tech­niques. They are required to under­stand the ratio­nale and under­ly­ing con­cepts of every­thing they do. The devel­op­ment of crit­i­cal think­ing, inde­pen­dence, and con­fi­dence gives these stu­dents a huge advan­tage as they con­tin­ue their edu­ca­tion and career after Mas­sas­oit. In August 2018, sev­en Mas­sas­oit Stu­dents pre­sent­ed their find­ings at the Eco­log­i­cal Soci­ety of Amer­i­ca (ESA)‘s 2018 Meet­ing. 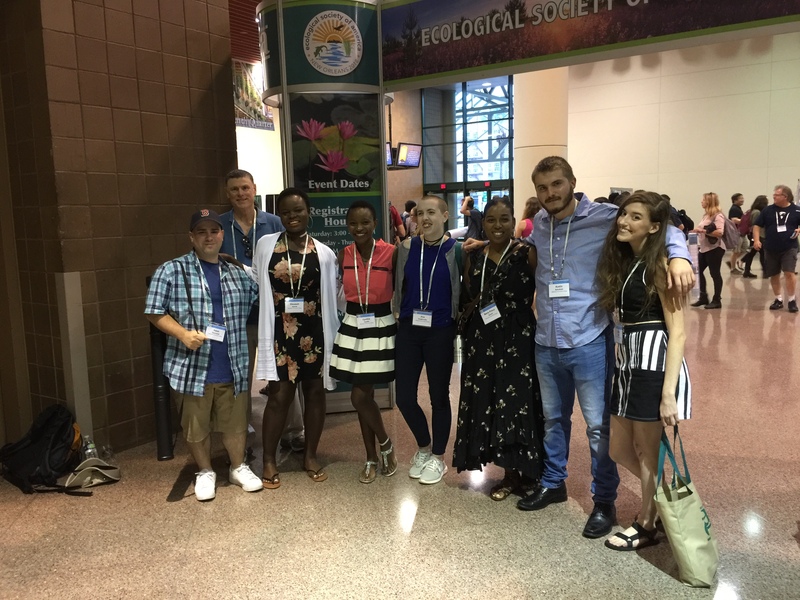 Mas­sas­oit Com­mu­ni­ty Col­lege was respon­si­ble for sev­en sci­en­tif­ic pre­sen­ta­tions at the 103rd annu­al ESA meet­ing in New Orleans, held the first week in August. Nation­al meet­ings like ESA require authors of poster pre­sen­ta­tions to sub­mit an abstract of their work months in advance of the meet­ing. These abstracts are judged strict­ly on their sci­en­tif­ic mer­it before authors are noti­fied of their accep­tance as par­tic­i­pants. Pre­sen­ta­tion at a soci­ety meet­ing is con­sid­ered a valid sci­en­tif­ic con­tri­bu­tion and is usu­al­ly added to ones cur­ricu­lum vitae, along with pub­lished peer-reviewed arti­cles. Par­tic­i­pa­tion at nation­al or inter­na­tion­al meet­ings is also pre­dom­i­nant­ly lim­it­ed to grad­u­ate stu­dents, post­docs, and active research­es with very few oppor­tu­ni­ties for under­grad­u­ate researchers to par­tic­i­pate. Fresh­men and sopho­more lev­el under­grad­u­ates almost nev­er attend, and it is notable that Mas­sas­oit was the only con­tribut­ing Com­mu­ni­ty Col­lege at this year’s ESA. More impor­tant­ly, our stu­dents per­formed at a lev­el that was on par with oth­er sci­en­tists with many more years of expe­ri­ence. The expe­ri­ence for our stu­dents and the respect earned for our col­lege is immea­sur­able. We are now accept­ing appli­cants for paid Research Intern­ships start­ing in the Fall 2018 semes­ter. To apply, please vis­it http://bit.ly/MCCSTEMIntern.